Talk about buried treasure! Many moons ago (or Wolverine series' ago - however you choose to measure time) I wrapped my hands on a high res scanner, and then copied the death out of some of my favourite 80's comics, in the hopes of locking away their awesomeness for life. Until I lost the disk. Well guess what I found? Yup, while I won't be flooding IADW with all frillon megabytes of four colour turned three colour goodness right away, to set you up for a little of what's ahead, here are four 80's DC house ads, that only get better with age. Part of the reason I scanned these suckers so big is so I could use them to cover books or as posters. The only thing that stopped Dr. Fate here going up on the wall; Grandpa pants. Fighting evil with a waistline that high and a wedgie is no way to go. When I first saw this, having never seen the character before, I thought The Question had a guardian dragon made of smoke. Although that wasn't the case, it was written by Denny O'Neil! That guy could write the phone book and I'd still read every word - literally. 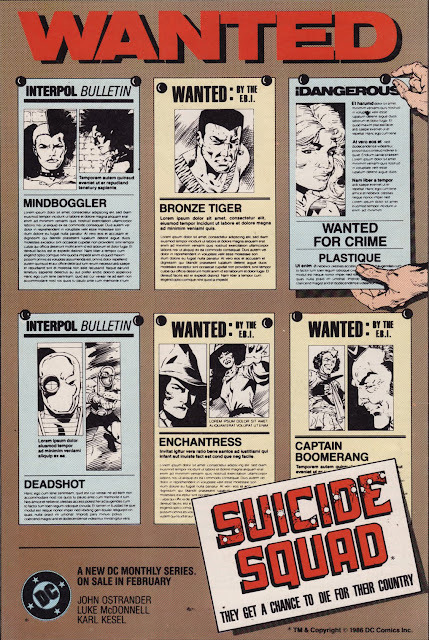 How can you look at 80's DC without Suicide Squad? I don't know what it was about this poster that made me a life-long fan straight off the bat, but I got more addicted with every monthly shot. Speaking of definitive DC 80'S, the revamped Justice League. Personally I think this is still one of the best line-up's going (Mr Miracle is so under-used)! Who needs Super-whatchamacallim anyway? What ones do you remember folks? ah yes i remember all these quite well. 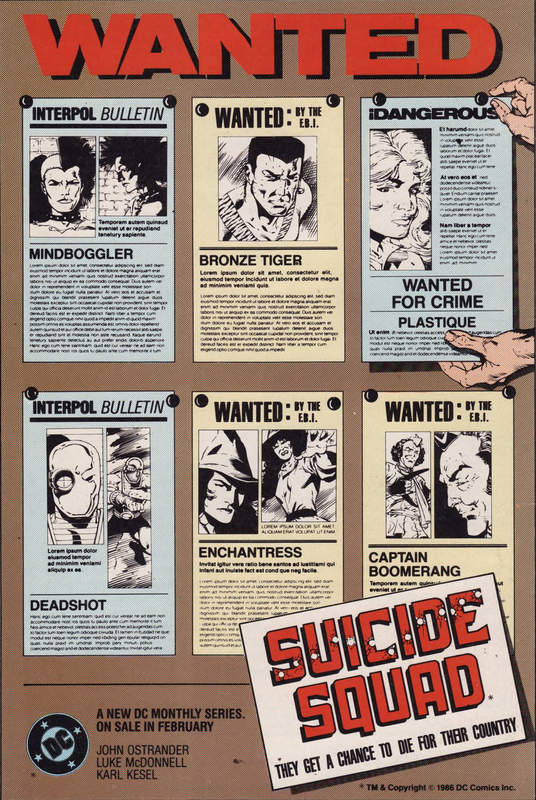 but ya know i never saw the color version of that Suicide Squad Wanted house ad before, cool. Dan - Great choices and great scans! Really awesome stuff. I remember these very well! 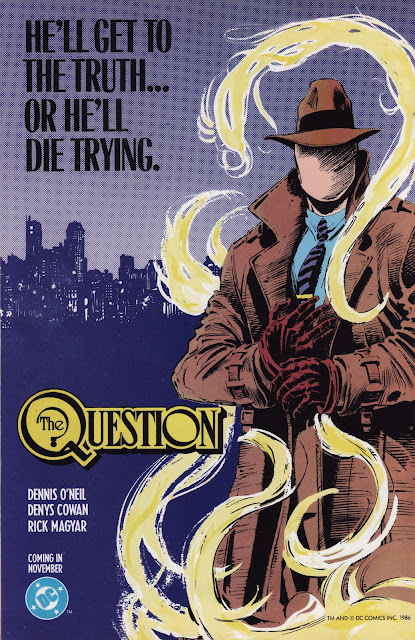 I'm a huge Doctor Fate and JLI fan, so those are especially near-and-dear to my heart. I had never seen that SS picture. Very cool. 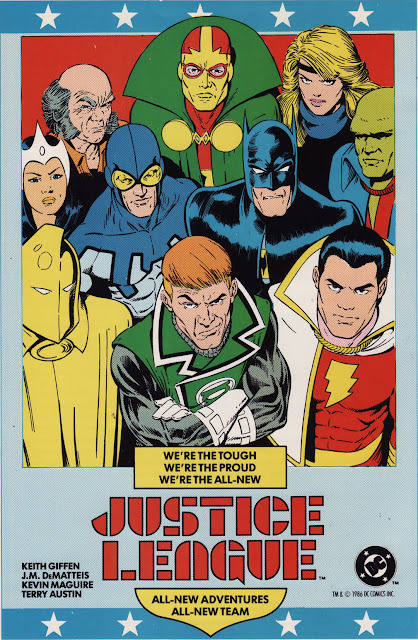 The JLI one is for me a classic. That's from when I started buying a reading monthly comics. They're very dear to me. The '80's were before my time for comics, but my best friend was into them pretty heavily. He had all four issues of Frank Miller's "The Dark Knight Returns". I remember being blown away by not just the covers but the whole concept. Thanks for the great comments people! The 80's was the best comic time Craig - awesome things were happening everywhere and a few books didnt break the bank! 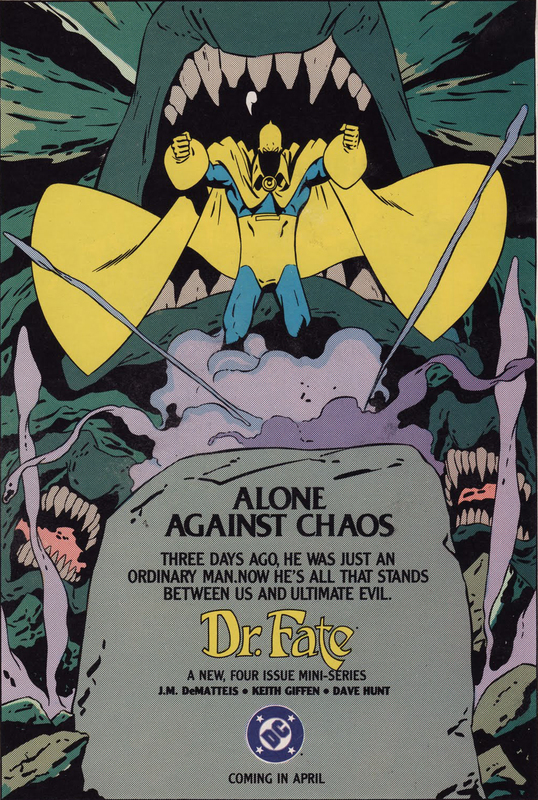 I do am a big Dr Fate fan Shag - I even wrote and drew a whole Fate vs Silver Surfer comic back in high school. I think it's the mask that hooked me! Will check out that link right after I post this! What a great bunch, Dan. Oddly, I don't recall that Suicide Squad poster at all. 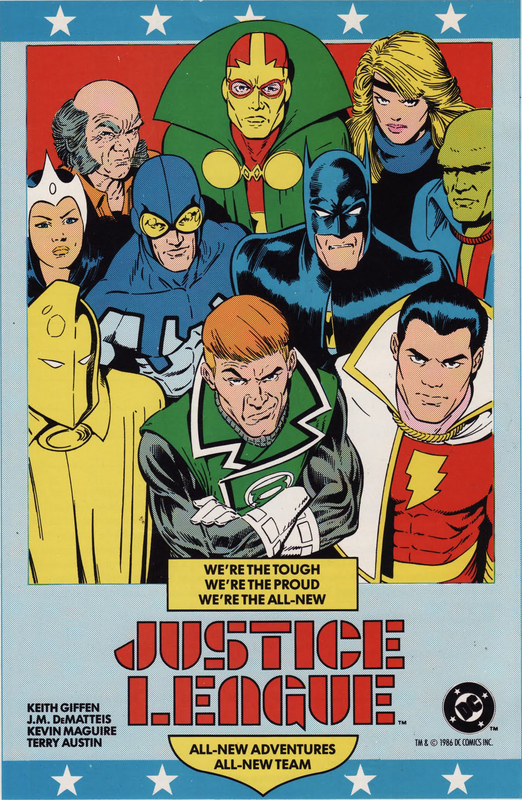 And that JLI poster/cover is so wonderfully misleading in terms of the team's attitude.